The 1914 and 1915 Cracker Jack cards are significant in several ways, not the least of which is the fact that they are the only cards which feature players from the short-lived Federal League. The two sets appear very similar and in fact have numerous near duplicate cards. An easy way to distinguish the sets is to look at the reverse. 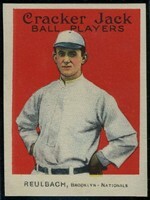 The reverse text of the 1914 series refers to a complete set of 144 while the 1915 cards refer to a set of 176. While all of these cards are difficult to obtain in decent condition, the 1915 cards are slightly easier to find because in addition to being available in the Cracker Jack boxes, people could order the full set by mail. Centering and overall condition are extremely important when evaluating baseball card values. Hobbizine vintage baseball card value guides list prices in five grades from Good to Mint. See the bottom of this page for more information about how these prices and grades are established. These vintage baseball card prices are provided as a service to Hobbizine readers. They are derived from numerous sources such as dealer price lists, advertisements in collecting publications, and public auction results. Use these values as a guideline for evaluating the reasonableness of dealer prices, setting up trades with other collectors, and estimating the worth of your collection. Mint -- Four sharp corners; Near perfect 60/40 or better centering of picture within border; Smooth edges; Original color border & gloss. About Mint -- 65/35 or better centering; May have one of the following flaws: Slightly fuzzy corners; Slightly rough edges; Minor border discoloration; Print spots color or focus imperfections. Extremely Good -- Centering 75/25 or better; A touch of notching or a corner ding; May have: Poor gloss; Poor focus; Significant print spots. Very Good -- Centering 80/20 or better; Rounded corners; Slight layering, chipping or notches on edges; May have: Minor scuffing; Hairline crease. Good -- Well worn or abused; Badly rounded, layered corners, scuffing; Some lack of original coloring; Significant crease.